For the past decade, Miami-Dade County Judge Steve Leifman has fought to get treatment for people with mental illness and keep them from ending up in jail. (9-12-18) Miami-Dade Florida Judge Steve Leifman has won the Pardes Humanitarian Prize for his leadership in reducing inappropriate incarceration of individuals with mental illnesses. 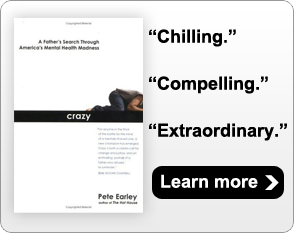 Judge Leifman is a good friend and also the hero in my book, CRAZY: A Father’s Search Through America’s Mental Health Madness. I am delighted and hopeful that publicity about this honor will encourage other judges to become leaders in developing jail diversion, mental health dockets and increased community mental health services for those in need. Are you listening judges, prosecutors and politicians in Virginia? Arrests in Miami Dade have decreased from 118,000 to 56,000 annually and recidivism has dropped by almost 50 percent. The jail population plunged from 7,300 to 4,000 inmates, closing a jail and generating $12 million in annual savings. Crime and burdens on taxpayers have been reduced, and public health, safety and recovery outcomes have improved. Press release announcing award — The 2018 Pardes Humanitarian Prize in Mental Health is being awarded to Judge Steven Leifman, an associate administrative judge in Miami-Dade County, who has been at the forefront of a public policy movement to reduce the number of people with mental illness in the criminal justice system. The award was announced today by the Brain & Behavior Research Foundation and will be presented at a ceremony in New York City on October 26. Nationwide, according to a survey by the National Alliance on Mental Illness, forty percent of people with serious mental illnesses have been arrested one or more times. An estimated 1.8 million people with serious mental illness are booked into jails annually, and on any given day 500,000 people with mental illnesses are incarcerated in jails and prisons. Judge Leifman is also creating a Mental Health Diversion Center, a public-private mental health facility in Miami-Dade for individuals with serious mental illnesses who are the most frequent users of services in the criminal justice, mental health and primary medical care systems. Scheduled to open in 2020, the center will provide a range of mental and primary health care services, as well as assistance with housing, employment training, daily activities and courtroom support. Nationally, Judge Leifman bridges the gap between the legal system, healthcare, public administration and politics. He was an architect of the Stepping-Up Initiative, a national coalition of mental health, substance abuse, government and law enforcement organizations; and a cofounder of the Judges’ and Psychiatrists’ Leadership Initiative, a collaboration between the Council of State Governments and the American Psychiatric Association Foundation designed to improve judicial, community, and systemic responses to people with behavioral health needs who are involved in the justice system. The Pardes Humanitarian Prize in Mental Health was established in 2014, and is awarded annually to recognize individuals or organizations that are making a profound and lasting impact in advancing the understanding of mental health and improving the lives of people with mental illness. It focuses public attention on the burden mental illness places on individuals and society, and the urgent need to expand mental health services globally. Nominations are solicited worldwide. The recipient is chosen by an international distinguished committee of eleven members and receives an honorarium of $150,000. The Prize is named in honor of Herbert Pardes, M.D., a noted psychiatrist, outspoken advocate for the mentally ill, and the award’s first recipient. The Pardes Humanitarian Prize in Mental Health is sponsored in part by Janssen Research & Development, LLC, one of the Janssen Pharmaceutical Companies of Johnson & Johnson. The Brain & Behavior Research Foundation awards research grants to develop improved treatments, cures, and methods of prevention for mental illness. These illnesses include addiction, ADHD, anxiety, autism, bipolar disorder, borderline personality disorder, depression, eating disorders, OCD, PTSD, and schizophrenia. Since 1987, the Foundation has awarded more than $394 million to fund more than 4,700 leading scientists around the world, which has led to over $3.9 billion in additional funding. 100% of every dollar donated for research is invested in our research grants. Our operating expenses are covered by separate foundation grants.